What happens to video games whenever they are turned off or shut down? Wreck-It Ralph is Disney’s latest venture into big screen animation that explores this question every first generation gamer asked when they were a kid. This nerdtastic idea may sound like Toy Story set inside video games, but this film actually appears to be telling a rather different story of a bad guy who wants to prove that he can change his destiny. Does Ralph manage to deliver anything of substance or does he succeed at wrecking audience expectations? Wreck-It Ralph begins in the day of a life of Ralph(John C. Reilly), the bad guy in an arcade game called Fix-It Felix Jr.(think Donkey Kong). Ralph wakes up in his dump, goes to destroy the same hotel over and over, and once the gaming day is done is treated as a pariah and left to his dump. As his game is about to turn 30 years old Ralph begins to question whether or not he really likes his role in life. After years of being the bad guy Ralph wants to be celebrated as a worthy part of his game in the same way that the game’s protagonist, Fix-it Felix(Jack McBrayer), is celebrated. On the 30th anniversary of Fix-It Felix Jr., Ralph crashes the anniversary party( quite literally) where he tells the citizens of the hotel his aspirations to play the role of the hero. Ralph is scoffed at and laughed out of the party, but before he leaves, Ralph vows that he will not return to the game until he has a hero’s medal. Ralph travels to Game Central Station to explore the other video games he can join into on the search for his medal. On his journey Ralph enters a game called “Hero’s Duty” (an arcade rip-off of games like Gears of War or Halo) and Sugar Rush(a cross between Mario-Kart and Candy Land). Eventually Ralph meets a girl named Vanellope von Schweetz(Sarah Silverman) from Sugar Rush who needs Ralph’s help to get herself back in the game. On the road to getting his hero metal and helping Vanellope, Ralph runs into a character from Sugar Rush known as King Candy(Alan Tudyk) who seems to have his own agenda running the world of Sugar Rush. The story here is simple yet charming as it provides a way for the writers to include tons of cameos from classic arcade games like Pong, Q*bert, Pac-Man, Street Fighter, Frogger, Burger Time, and many more. These cameos fit just right; making it into to the movie to get a laugh or a smirk from long time gamers, but not used so heavily that they turn away kids or adults who have never had that experience with classic arcade games. The movie manages to move at a really brisk pace and always stays interesting and funny. Even when the movie is setting up the premise, it manages to deliver laughs and aha! moments for the audience to enjoy. I found the final act of the movie to be a little drug out. The movie does a great job at exploring various gaming worlds, but the movie easily spends most of its time in Sugar Rush which gets a little tiresome by the time the movie reaches its conclusion. It is a minor complaint as Sugar Rush was interesting, but the movie eventually begins feeling like Candy Land the movie as opposed to a movie about video games. I would have liked to have seen many of the other places Wreck-It Ralph could have explored, but it appears that Disney is keeping those cards up their sleeves for sequels. The underlying ideas found in the story are really solid and are especially relevant in today’s world where it sometimes seems like people are treated more like employees than actual people. In the movie Ralph struggles with his role in Fix-It Felix and he has to go on a journey to discover who he truly is outside of his job. In a society that currently puts such an emphasis on careers, education, and job experience, this idea of separation between job and self is certainly something that will appeal to older audiences. The film encourages all of us to figure out who we are, but also reminds us that we all have a role to play in the world we live in. This theme of finding one’s way in the world certainly resonated with me and I believe that it will resonate with the wide audiences as it is something that all of us run into in our lives at one point or another whether it be at school or in the office. Wreck-It Ralph has some absolutely gorgeous visuals that are particularly notable once the movie gets to Sugar Rush which puts the screen into a sugary-color overload. Every frame of this candy kingdom is absolutely loaded with vibrant colors that is constantly changing and surprising. The animation in this movie may not be quite as creative as something out of a Pixar movie, but it is still top notch. I saw this movie in 3D, and I can’t say that I was impressed with what I saw. The 3D was there and it didn’t hurt the movie at all, but I never once was compelled by what the “enhanced” experience was offering. If you’re going to catch this one in the theater I recommend saving some money and catching it in 2D. 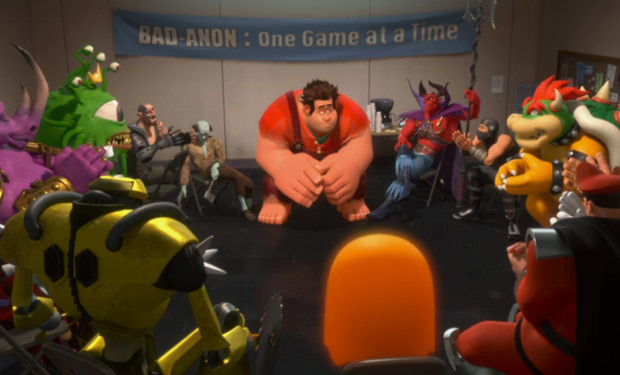 Overall Wreck-It Ralph may have out Pixared Pixar this year by giving us an animated movie that delivers a fun story that still manages to to have a real heart and human connection underneath the video game/arcade gimmick. While the story may not get an A for originality in its concept, it still manages to tell a story that is different by relating to its audience by means of video games. Wreck-It Ralph delivers characters that are certainly flawed, but ultimately charming and likable enough to keep the audience invested. The movie brings all of these elements together to create a movie that everyone can enjoy even people who are not interested in video games. In the end Ralph gives us the one of the best video game related movies ever made and the best animated film so far this year all in one fell swoop. Wreck-It Ralph is definitely one experience that neither gamers nor family going audiences will want to miss. The base concept certainly sounds like something taken from Toy Story, but Wreck-It Ralph takes its own path by focusing less on the video games in the movie and more on Ralph journey to self discovery. The cameos and inside jokes will certainly entertain gamers, but the movie has a foundation strong enough not to lean on the gimmick. The movie puts just a little bit too much emphasis on Sugar Rush by spending nearly half of the movie there instead of exploring various other gaming locales which is disappointing. None of the characters in the movie are particular deep, but all of them even King Candy are interesting enough to invest in. Ralph’s story is the anchor of the film and John C. Riley delivers on a performance that is both charismatic and sympathetic enough to be intriguing. Director Rich More oversees this story and gives it a great sense of humor and the charm to separate it from the other major animated movies released this year. The visual style and the art direction is strong and lively, but not particularly creative. 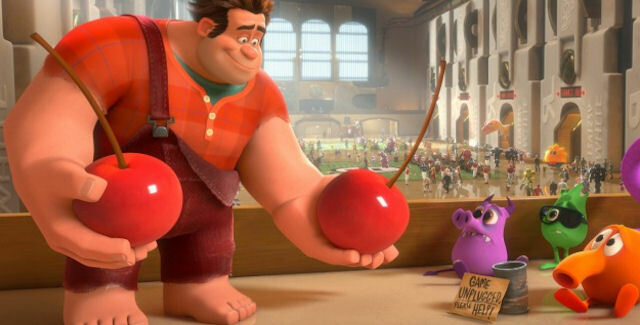 Wreck It Ralph delivers the best animated movie of the year by bringing together lots of cool story ideas and mixing them with a solid art direction and lots of gaming material. While not partiuclary original this movie is executed in a way that is nothing short of exceptional which makes for a likable and overall enjoyable experience that I’ll gladly revisit any day.